A. eriocephalus Willd., Sp. PL 3:1333 (1802). Map 28, p. 127. Dwarf shrub. Leaves l.5-3(-5) cm; rachis spiny; leaflets 5-8 mm, elliptic, mucronate, both surfaces simple-villous, 4-7-paired; stipules 6-8 mm, triangular-lanceolate, white-hairy or glabrescent, joined for two-thirds of their length. Inflorescence globose or oblong, with 4-15 sessile flowers. Bracts 5-9 mm, lanceolate to linear, white-hairy at apex, sometimes purple-tipped. Bracteoles absent. Calyx 9-14 mm, tubular, white spreading-simple-pilose, often glabrescent towards base; teeth 4-8 mm, setaceous. Corolla pink; standard 10-14(-15) mm. 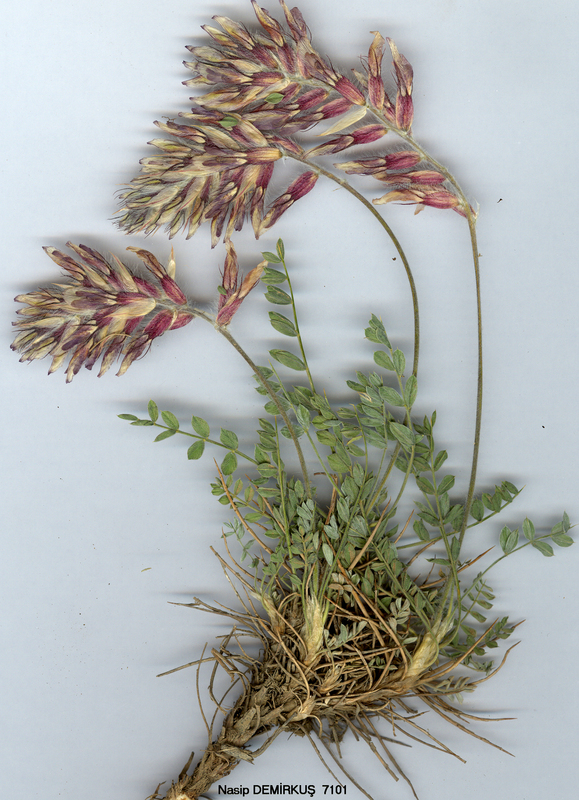 Legume unknown. Fl. 6-8. Mountains, hilly steppe, 2000-3000 m.
subsp. elongates Chamb. & Matthews in Notes R.B.G. Edinb. 29: 295 (1969). Type: Turkey C10 Hakkari: d. Yüksekova, Sat Da., NW of Sat Gölu, 2900-3000 m, Davis 45683 (holo. E!). S.E. Anatolia. B9 Bitlis: 30 km from Nemrut Da., 2220 m, Birand & Kara-manoğlu 229! Muş: between Bulanik and Muş, 2000 m, Hub.-Mor. 10681! A specimen from B9 Ağri: between Ağri and Doğubayazit, 1750 m, D. Walton 33! has bracts which are narrowly ovate. A gathering from C10 Hakkari: 21 km from Bacirge to Yüksekova, 2230 m, D. 45231! is somewhat intermediate between the two subspecies. The leaflet indumentum is fairly dense, but the inflorescence is subglobose; the flowers also have two minute, linear bracteoles. The species is endemic to Turkey. Ir.-Tur. element. Allied to A. karabaghensis.